Join me in discovering the life of the vertical adventurer. My Interview on ‘The Enormocast’! I had spent the last 4 weeks bolting new sport routes in Indian Creek, Utah, where I was fortunate enough to run into climber and podcasteur, Chris Kalous. Chris has been the voice of climbing on the interwebz for over two years now. His rich and sultry voice has been many climbers only break from NPR and This American Life podcasts on those long road trips to wherever the temps are good for sending. The Enormocast spawned out of the old ‘Off Belay’ podcast, which I had been following from the beginning. After the dissolution of ‘Off Belay’, Chris ventured on his own, and has been spewing out an hour of content twice a month, for 67 episodes now, with no end in sight. 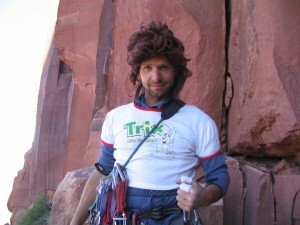 Chris Kalous – So you know what he looks like if you see him at the crag. 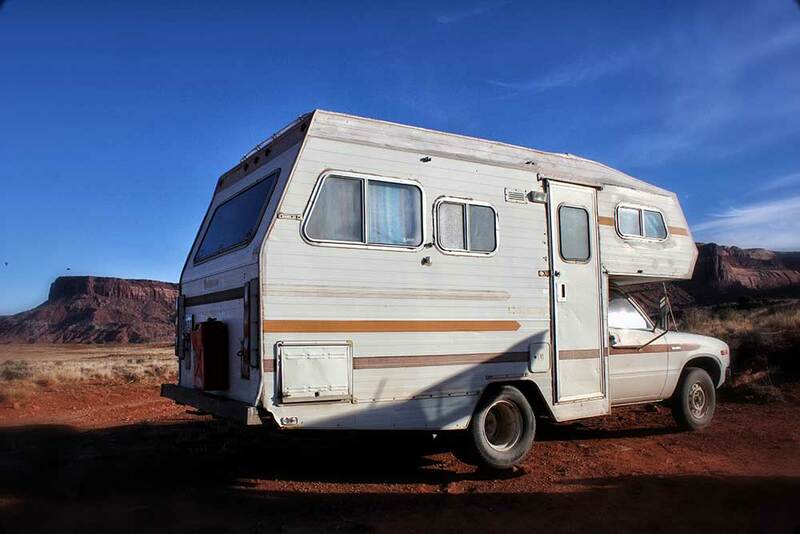 So there I was, drill in hand, rapping down from a potential off-width sport route, when I spotted the mobile studio and home on the road that we’ve all heard mentioned on countless episodes. Chris and I had been trying for a while to connect for an episode of The Enormocast, though strangely, I was never able to reach him, nor find out where he was, so setting up an interview was a scheduling nightmare. It was mere happenstance that I was able to get to him in time before he was able to change a flat tire on the Del Fuego. At first, Chris didn’t recognize who I was, until I mentioned to him that I was a fellow guide and internet personality, known for helpful tech tips, and training advice, movie reviews, opinion pieces, etc.. I spent a few minutes listing off some of my more popular posts. “YES!” I shouted! It was great being ‘recognized’ out in the real world. This is how pro climbers must feel, I thought. Chris went into the front of the camper to grab a tire iron, as I began grilling him on why it’s taken so long for us to get together. I told him I had tried getting in touch with him before, but he explained his inbox is so full, my email must have been lost in the ether. Makes sense, I literally have almost a hundred emails from clients and sponsors clogging up my inbox on the daily. Chris was struggling with lug nuts as I asked him when he thought we could record an episode together, as I was in town for a few more days and would be available any time. He told me he was getting out of the Creek as soon as possible, and he didn’t have his recording equipment. That’s when I had a brilliant idea! An impromptu, outdoor recording session with me and Chris Kalous, recorded entirely on his iPhone! No scripts, no rehearsal, no editing! Chris’ skirmish with the spare tire was far from over, so after a few moments of hesitation, he whipped out his phone, hit record, and we started. I wont get into details about the interview, since I don’t want to ruin the future epsisode, but let’s just say, the world better be ready for Wesley Summers! It took Chris a little over an hour to change the flat, and in that time, I feel I was able to express my best ideas about climbing, about life, about love, loss, failure and success. Chris agreed it was one of his favourite interviews. If he wasn’t in such a hurry to get out of there, I would have wanted to play it back and listen to the whole thing, but I guess I have to wait with you guys! Will keep you posted when I hear from Chris! This entry was posted in Uncategorized by thewesleysummers. Bookmark the permalink. Wow Wes! You’re becoming awesomer and awesomer! What Wesley is leaving out of the story is that just before I was going to leave, I clocked him on the jaw with my tire iron, then two solid thumps at the base of his skull and I thought he was dead for sure. I dragged him to the reservoir and dumped him in, riddled his body with bullets so he would sink, and tossed my phone in after him- my plan is up for renewal anyway, so I’ll get a 99cent Iphone 5s for sure. How he survived is a mystery, or just sloppy work on my part, or a testament to his zest for living. I don’t know which. So I guess he deserves another shot on the mic. Too bad his first take is lost. We talked a lot about his days as a GoGo Dancer in the Kruezberg District in Cold War Berlin. Listen Bro, you need to connect to jah rockstone man, you see climbing as a simple ritual of pulling man climbing is a lifestyle bro, it is the feelign of seeing the stars after a long sesh, it is the conection, jah way rock lets you know if it will grant you passage up it’s landscape. the real test is what can you make out of the lessons rockstone teaches you man? what can you learn? will your soul survive from the love of the climb or are you just into the before and after man? like the rockstone is love it is life man you need to accept the chase of the pump into your life man, let the stone heal your open wounds man. let the feeling of the stone touch your soulfire, let the original herbals smell your soul and accept the way ganjiya tell you love of rockstone maan let it help you help others man, you will learn the rockstones way you will learn the healing process of trying hard. you will not need material products maan you will only need open air and rockstone to live man. grades are only superficial opening to a false soulfire created by man. escape babylon brother, escape before burning spear rip jah heart from fire soul. now i only live to get radical jah dub maniac what dey call me. i live in a new babylon, i run buisness for prfit, my soulfire is only coals. dont let grades and others burn your soulfire to coals. your brother, freind, omprakash, chris….call me what you like, i love all human form of jah real.